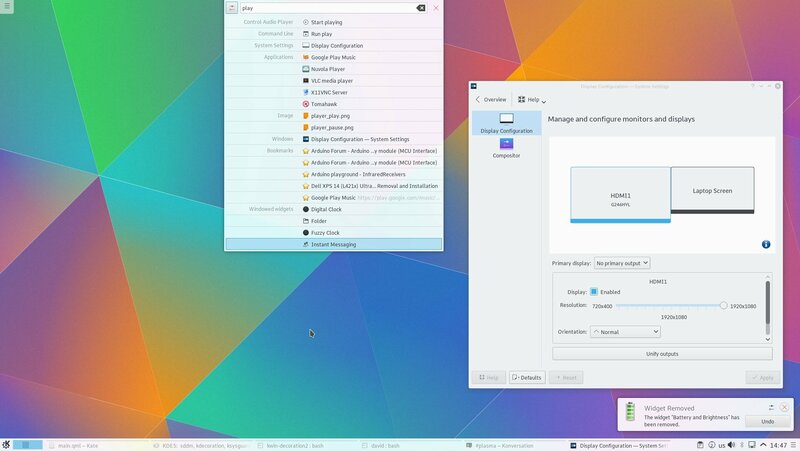 KDE Plasma 5.2 has been announced today with a number of new components, new features and many more bug-fixes. BlueDevil to manage Bluetooth devices. KSSHAskPass, a graphical UI to enter SSH keys’ passwords. Muon: install and manage software and other addons for your computer. KScreen, a System Settings module to set up multiple monitor support. GTK Application Style, configure themeing of applications from Gnome. KDecoration: this new library to make themes for KWin, Plasma’s window manager. Breeze window decoration theme is now used by default. Various improvements and over 300 bug-fixes. Fore more details, go to KDE.org. For (K)Ubuntu 14.10 and derivatives users, the latest packages are available for install / upgrade at the Kubuntu Next Backports PPA. The kubuntu-plasma5-desktop package doesn’t seem to exist for me. The package name now is plasma-desktop. Upgraded to 5.2 but went back to Ubuntu Gnome. Plasma 5.2 is far from stable! * File-manager is very unstable when viewing / opening / editing files on a NAS station. The file manager keeps crashing when enabling / disabling the preview mode. Sometimes i cannot connect to the station. Requires a reboot. * The ‘hot corner’ feature is very buggy. It works, or it doesn’t work. Sometimes nothing happens and after a restart it works again. * The desktop is toasting my Nvidia Graphics card. Temperature often gets to 60 degrees Celsius, while in Ubuntu it keeps at around 33. Not sure whats going on here. * And a lot more issues…! The new Plasma 5 desktop isn ‘t stable enough and brings a lot of problems. Do not upgrade if you need a well working system. In my case (Kubuntu 14.10) the (next) booting process stopped with Plasma 5 after running the filemanager (dolphin) as root. No chance to run the x-server. Perhaps it is a problem with Nvidia Graphics cards. So I had to cancel the system and return to Plasma 4…. I hope that the KDE People fixed these heavy bugs in the next versions. @Wolfgang ,,,,,,,, you do not run dolpin as root (it is shure to hijack the ownership/permitions of your files and posablie ~/.Xauthority as well , and you will be locked out of your login. if you must run as root use “kdesudo dolphin” and not just sudo or starting from a root shell .